16 oz. (450g) (1 pound) resealable pouch. Rolls approx. 600 sticks, or 3 cartons. Click Here For GAMBLER TUBE CUT INJECTOR MACHINE. Makes 100's & King Size. Click Here For SMOKING TUBES and find your favorite style (Full Flavor, Light or Menthol). 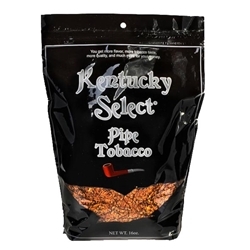 Kentucky Select Pipe Tobacco is a specialty blend based on US Flue-Cured and Burley tobaccos. Held in high regard in the pipe tobacco market Kentucky Select is a great bargain buy the beginner and a perfect all day smoke for a more experienced user.